← Plaid: Rad or Bad? 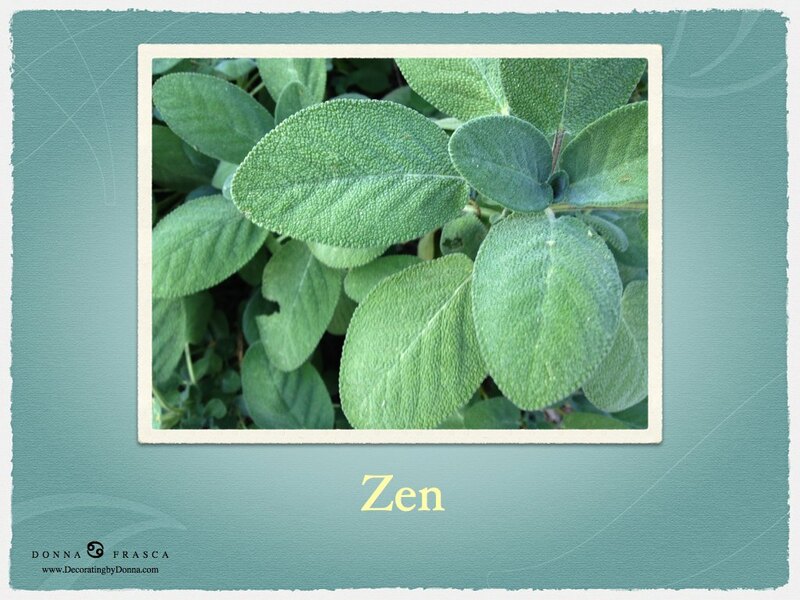 I wanted to share a little tid-bit about Sage and it’s tremendous Holistic properties. As many of you know color is a big part of my life. For those of you who are visual people, color plays a huge roll in how we feel. So as color trends move away from blue and gray, they move closer to green which in my opinion, should be the #1 hue to have in the home. I’ve spoken about holistic color before and how some colors make you feel a certain way or trigger memories both good and not so good. • So, if you’re feeling stressed. Think pink! • Need a boost of energy? Go for the yellow or orange. • Feeling really good about yourself? Red is a great power color to wear. • And as far as sage, not only does it smell wonderful it also is a great color for the home because of its Holistic appeal. Look at that green and just feel your stress go right out the window. Voice of Color chose a similar green for their color of there year, you can see that here. I have a very similar color in my living room and I probably won’t ever change it. It feels and looks that good. Sage has many medicinal purposes as well as both healing (sage comes from the words “to heal”) and of course from it’s Spiritual cleaning rituals as well. So there you go! Just was in a sagey mood today and thought you’d like to know a little more about this beautiful plant. Oh and I also grow it in my yard which is where I got this picture from, and it’s extremely drought resistant so plant away next summer! This entry was posted in Holistic Colors and tagged Color Cures, Sage. Bookmark the permalink. I am seriously considering Paradise Found for my dining room. I’ve got two samples going on right now, and they’re neither one quite what I want. I thought maybe Monday I’d go pick up a sample of Paradise Found and Modern Mint. *sigh* We shall see. Also, look at the greens that Valspar has. They have some of the best silver greens anywhere. I didn’t like that paint. I’m seriously partial to Behr, but I did like Pittsburgh. Is there a certain kind of paint type from Valspar you’d recommend? I really prefer thick and creamy coverage. Valspar used to have Signature – that was really, really thick – too thick if you ask me. I always use their Ultra Premium – it’s in my home. Behr – I’d stay away from that brand. Oh no. I love Behr! Five rooms of my house are Behr. I think we must be opposites on paint preferences. But I will see what Valspar has to offer, color-wise. I had Behr in my house too and like it BUT it just doesn’t have the staying power that some of the other high quality paints have. It’s ok though – just ok.